(2) Socioecological Movements in Urban Ecosystems (MOVE; Dnr: 211-2011-1519; including two sub-projects, CIVNET and NOTRUC). These projects have in turn been instrumental in forming The Situated Ecologies Platform and The Situated UPE Collective with lots of network-building and activities beyond peer-reviewed publications, including film projects, PhD courses, public engagements, and the construction of their two respective websites (here and here). Please read the PI’s reflection on activities beyond peer-reviewed publications here. If you like to have PDF-copies of these publications, most can be downloaded from the authors’ Academia.edu, Mendeley or ResearchGate home pages. You can also contact PI at his e-mail address here. Note, the list is still not exhaustive (as of 12 January 2018) as it doesn’t yet include contributions from all project members (see Footnote 1, 2 and 3 at the bottom of this page ). Comanagement at the fringes: Examining stakeholder perspectives at Macassar Dunes, Cape Town, South Africa—at the intersection of high biodiversity, urban poverty, and inequality. Ecology and Society, 17(3). Re-translating nature in post-apartheid Cape Town: The material semiotics of people and plants at Bottom Road. In: Actor-Network Theory for Development (June), 1–35. Retrieved here. Situating Ecologies and Re-distributing Expertise: The Material Semiotics of People and Plants at Bottom Road, Cape Town (pp. 1–20). (Re-written version of the above.) Retrieved here. Ecosystem services as technology of globalization: On articulating values in urban nature. Ecological Economics, 86, 274–284. by *Henrik Ernstson and Sverker Sörlin (2013). Urban green commons: Insights on urban common property systems. Global Environmental Change, 23(5), 1039–1051. by *Colding, J., Barthel, S., Bendt, P., Snep, R., van der Knaap, W., & Henrik Ernstson (2013). Conceptual Vectors of African Urbanism: ‘Engaged Theory-Making’ and ‘Platforms of Engagement.’ Regional Studies 48 (9): 1563–77. 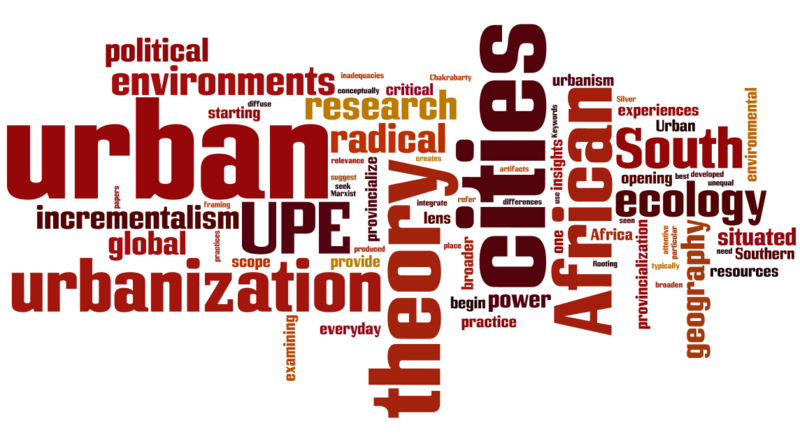 Provincializing Urban Political Ecology: Towards a Situated UPE Through African Urbanism. Antipode, 46(2), 497–516. by Mary Lawhon, Henrik Ernstson and Jonathan SIlver (2014). Situated, networked environmentalisms: a case for environmental theory from the South. Geography Compass. Local sustainability and the politics of scale: Rethinking governance and justice in an era of political and environmental change. Environment and Planning C.
Industrial nature, Chapter in Anna Storm’s monograph Post-Industrial Landscape Scars (Basingstoke: Palgrave Macmillan). Food and Green Space in Cities: A Resilience Lens on Gardens and Urban Environmental Movements. Urban Studies, 1–18. Food insecurity amongst urban households in Fukido-Parr, S. & Taylor, V. (Eds.) “Food Security in South Africa”, Juta Press, Cape Town. Transformative collective action: a network approach to transformative change in ecosystem-based management. In Ö. Bodin & C. Prell (Eds. ), Social Networks and Natural Resource Management: Uncovering the Social Fabric in Environmental Governance (pp. 255–287). Cambridge: Cambridge University Press. Social Network Analysis (SNA). In D. Fogel, S. Fredericks, L et al.. Harrington, & I. Spellerberg (Eds. ), The Encyclopedia of Sustainability: Vol. 6. Measurements, Indicators, and Research Methods for Sustainability (Vol. 6, pp. 322–325). Great Barrington, MA: Berkshire Publishing. The social production of ecosystem services: A framework for studying environmental justice and ecological complexity in urbanized landscapes. Landscape and Urban Planning, 109(1), 7–17. Ecological outcomes of civic and expert-led urban greening projects using indigenous plant species in Cape Town, South Africa. Landscape and Urban Planning, 127, 104–113. Linking regional planning and local action: Towards using social network analysis in systematic conservation planning. Biological Conservation, 169, 6–13. A ‘Political War of Words and Bullets:’ Defining and Defying Sides of Struggle for Housing in Crossroads, South Africa,” Journal of Southern African Studies, (41) (2), 367-387. Writing My History is Keeping Me Alive: Politics and Practices of Collaborative History Writing,” in A Reflexive Inquiry into Gender and Gender-Based Violence: Toward a New Paradigm of Knowledge Production Across Multiple Divides, edited by Pumla Gobodo-Madikizela and Samantha van Schalkwyk (Cambridge Scholars Publishers), 103-129. Graphic Novel Histories: Women’s Organized Resistance to Slum Clearance in Crossroads South Africa, 1975-2015,” African Studies Review, Kathleen Sheldon and Judith van Allen (eds.) Special Edition: 40th Anniversary of the Writing of African Women’s History Part II, (59) (1), 199-214. Of Plants, High Lines and Horses: Civics and Designers in the Relational Articulation of Values of Urban Natures.” Landscape and Urban Planning 157: 309–21. by Hanna Erixon Aalto and Henrik Ernstson. 2017. 300 Years of Shackdwelling and Women’s Organized Resistance in Cape Town,” in Richard Pithouse and Gary Minkley (eds.) Out of Order: Popular Mobilisation in Contemporary South Africa. (Fort Hare University Press). Occupying History: Collaborative Documentation of a Land Occupation: Kaptiensklip Cape Town 2011-2013” in Fred Hendricks and Lungisile Nsebeza (eds). Intellectuals and Popular Struggles in South Africa. (CT: Jacana Press). Benson, Koni and Asher Gamedze, and Akosua Koranteng (forthcoming 2017) “African History in Context: Toward a Praxis of Radical Education,” in Aziz Choudry and Salim Vally (eds.) History’s School: Past Struggles and Present Realities. (London: Routledge). Interrupting the Anthropo-obScene: Immuno-biopolitics and Depoliticizing More-than-Human Ontologies in the Anthropocene.” Theory, Culture & Society. by Erik Swyngedouw and Henrik Ernstson. 2018, forthcoming. by Joshua A. Lewis and Henrik Ernstson. 2018, forthcoming. SACHED and Spin Offs since 1959: Exploring an Archive of African History Education Initiatives in Conversation with South African Student Movement Activists Today,” Education as Change. Special Edition: Community and Activist Archives. Retrofit and urbanized ecosystems—Towards a critical approach with notes from case studies in New Orleans and Cape Town (pp. 1–13). Conference paper at workshop at University of Manchester, Manchester, UK. Global South Urbanism and Situated Ecologies: Location, Translation and Epistemological Politics.” 1. Situated Ecologies Working Series. Stockholm and Cape Town. Tracing the Political in ‘the Local’—crafting a Translation Device from Cape Town to Paris and Four Interventions for Atelier D’architecture Autogéneré.” Cape Town. Framing the Meeting: Rupturing the Anthro-Obscene! The Political Promises of Planetary and Uneven Urban Ecologies.” In Rupturing the Anthro-Obscene Conference, edited by Henrik Ernstson and Erik Swyngedouw, 17–19 September. Stockholm. Is local still lekker? The viability of the Philippi Horticultural Area, Society of South African Geographers 9th Biennial Conference, Cape Town 21-21 June 2012. New Methodologies in Radical History Education as Social Intervention,” at Cultura Viva Comunitaria, 20-25 Nov 2017, Quito, Ecuador. (The Art of?) History Writing,” Popular and Elite Art Writing in South Africa: Frictions, Fictions and Functions, Cape Town, Greatmore Studios, 22 March 2017. Benson, Koni, “Reconfiguring Power: Collective Resistance Histories in South Africa’s Past and Present” at CODESRIA Gender Symposium: Women’s Struggles Today 9-10 May 2016, Cairo, Egypt. Benson, Koni, “Art, Activism, and African History: Co-creating a Graphic Novel History of Women’s Resistance Movements in Crossroads South Africa, 1975-2015,” Radical(izing) Collaborations Through Academic Research: Possibilities and Limits, 23-24th June 2016, Cape Town. Mind the Gap: Collaborations in Science,” South African Young Academy of Science, SAYAS, Symposium on Science and Society in Africa: Fact, Fiction, and Media: Re-Imagining Science Engagement and its Impact, Cape Town, (28 Sept, 2015). Occupying History: Collaborative Documentation of a Land Occupation- Kaptiensklip Cape Town 2011-2013,” Intellectuals and Popular Struggles: A Colloquium of Engaged Scholarship, University of Cape Town (4 September 2015). ‘I was never a witdoeke:’ Living Legacies of Vigilante Activity in the Largest Apartheid Era Forced Removal,” South African History Association Conference, Stellenbosch University, (1 July 2015). Histories of struggle and struggles over history- women’s organized resistance to forced removals in Crossroads Cape Town 1975-2015,” UHURU Center, Rhodes University, (10 June 2015). ‘I live where I like’: A presentation and discussion on resistance to slum clearance in Crossroads, South Africa and in Chennai,” Madras Institute for Development Studies, India (2 March 2015). The Past in Present Protest? A History of Crossroads Women Occupying the Cape Town City Council Housing Offices in Post Apartheid South Africa,” Department of Historical Studies Seminar Series, University of Cape Town, (29 April 2015). Towards a History of Resisting the Installation of Pre-Paid Water Meters in South Africa,” Seeding Climate Justice Conference, Maputo Mozambique, (22 April 2015). Several more to be added. See above mentioned on Conference Papers. Pluralizing or Provincializing Urban Political Ecology? [In a World of Cities].” Situated Urban Political Ecologies Commentaries. Henrik Ernstson. 2014. How to Protect Urban Green Spaces for Food Production ? From Urban Movements to Private Trusts . A Concept Note .,” no. November. Henrik Ernstson. 2012. Making Capetonian Urban Nature Public : Recognizing the Restoration Project at Princess Vlei beyond Its Immediate Locality,” 1–8. Henrik Ernstson. 2011. Concept Note on the Organization Cape Flats Wetland Forum (CFWF). Henrik Ernstson. 2011. Several more could be added. [Footnote 1] Current publications are from the following project members: Henrik Ernstson (PI, MOVE, WOK-UE, CIVNET, NOTRUC), Marnie Graham (PhD candidate, WOK-UE), Mary Lawhon (then Postdoc, WOK-UE), Pippin Anderson (MOVE), Jane Battersby (WOK-UE), Anna Storm (Postdoc, WOK-UE), and Koni Benson (NOTRUC; first year as Postdoc). [Footnote 2] Note that more contributions can and will be added from Joshua Lewis (PhD candidate, WOK-UE, MOVE), Sverker Sörlin (WOK-UE), Mario Diani (MOVE, CIVNET), Lorien Jasny (MOVE, CIVNET), Wayne Zipperer (MOVE), Jacob von Heland (WOK-UE), Suraya Scheba (NOTRUC; first year as Postdoc); and Edgar Pieterse (NOTRUC, Co-I). [Footnote 3] Articles marked with one is from WOK-UE*; two from MOVE**; three and four from CIVNET*** and NOTRUC**** respectively, which are both part of MOVE). Publications marked with # has also been produced as part of the African Food Security Urban Network AFSUN project, which has collaborated with WOK-UE researchers. Entires marked with ^ are supporting publications with either more theoretical content, or not drawing directly on data generated from the projects.